I love Halloween! 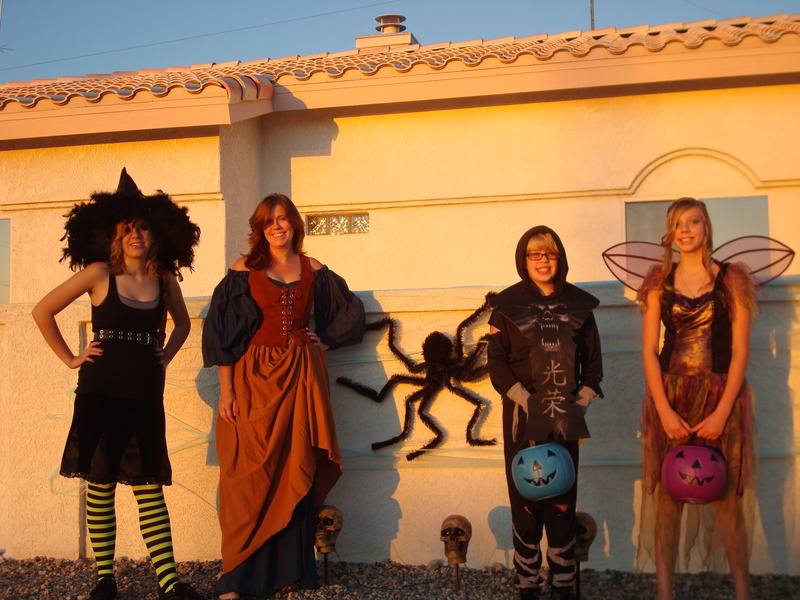 In Havasu, we’ve had an entire weekend of ghoulish fun! Callie had a blast with her sleep-over/Halloween party. While she was busy with that, the rest of us went to the Fall Fun Fair. Josh and Megan walked the whole fair and then chose the booths they wanted to spend their tickets at. Josh SCORED at one of the booths where two little girls knew him. They begged him over and over to play their game, and he finally gave in. [I think he was playing hard to get. Amazingly enough, he was doing it right.] When he was done with the game they LOADED him up with candy. Yep, definitely doing it right. He also went back to their booth later. Smart kid. Megan had some freedom to roam the place, and I think she appreciated that. 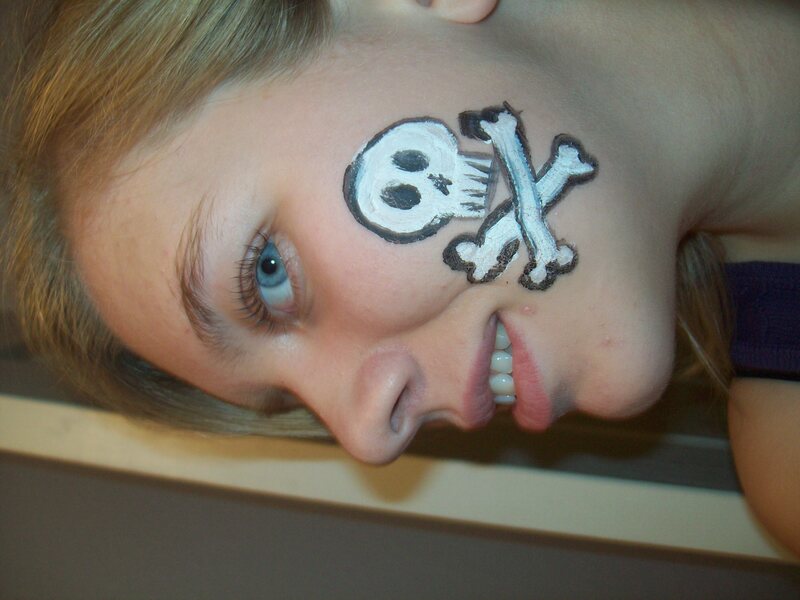 She hung out with some of her friends, and got her face painted with a skull and crossbones. That was another big “mom” step for me, letting her be free to walk around on her own. But, I knew it was a safe place and it felt good to let her have some more grown-up like independence. We all met up at the end and as we were getting ready to leave, we saw ‘them’. Just because you can, doesn't mean you should!! I’ve noticed more and more that Halloween seems to be an excuse for women to dress more ‘scantily’ than is socially acceptable. I will NOT say ‘provocatively’, because in most cases it simply hurts the eyes and brains to look at them, thus being the exact opposite of provocative. We saw a pair that would absolutely burn the eyes right out of your head. Pink spandex stretched so tightly it became see-through-pink spandex. The accompanying black spandex pants just gave that perfect ‘oomph’ to the sausage link look she was going for. 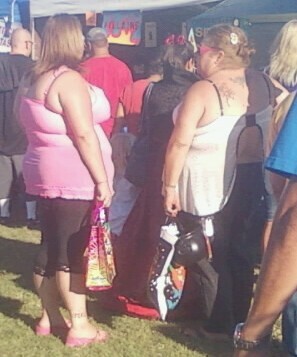 Her friend, in the white lacy top that had a bra-like closure in the back, was equally cringe-worthy. For you women who want to dress like this for Halloween (or, God FORBID, any time of the year), I have one piece of advice for you that I dearly wish you heed for the sake of my eyes and brain: JUST BECAUSE YOU CAN, DOES NOT MEAN YOU SHOULD. Learn it. Love it. Live it. Seriously. 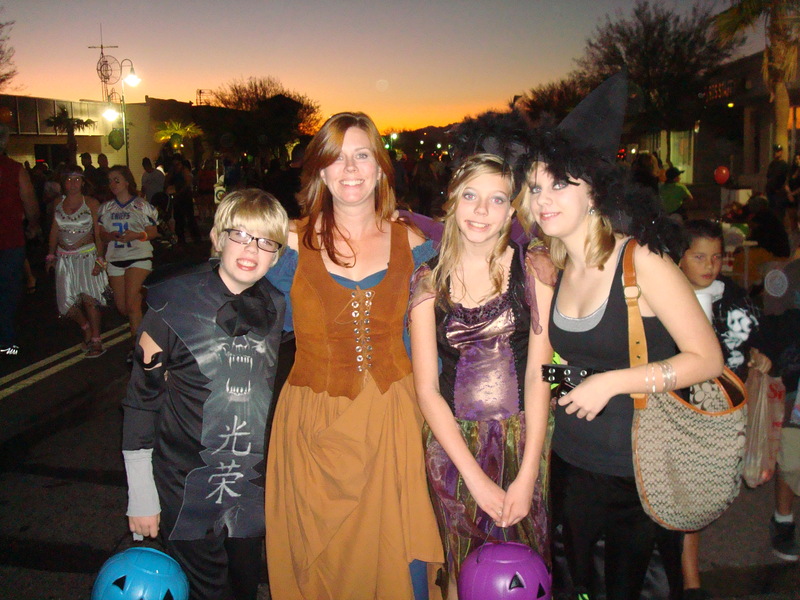 Main Street Halloween Fright Night! There weren’t too many people there at first, and the kids were a bit hesitant about going up and trick-or-treating the booths that were set up. That shyness wore off by the third booth. I realized that I really like that they’re old enough that I don’t have to hold their hands and go trick-or-treat with them. I could just walk along, keeping them in my eyesight, and enjoy the evening. No work for me! WOO HOO! (That was NOT sarcastic, by the way) By the time it got dark, it had become completely crowded. And that was when I was glad Mister wanted to be an early bird and get the very best parking space. I also quickly became very irritated with the crowd. People, leave your dogs at home. Especially the couple trick-or-treating with their baby in the stroller. I wouldn’t have minded so much if they would have moved more than three inches per minute. I put a slide show of the rest of the pictures below. You need to watch it just to see Josh with his candy haul. Incredible. Happy Halloween! Loved your description of the “sausage link look”..that killed me! LOL! Looks like and sounds like you all had a great time! The sausage had a couple of small (at the time) rips in its casing. I scurried away, just in case the whole thing might start to explode. The picture does NOT do it justice as you don’t get an honest sense of the size of that “brat” and the struggles of the spandex. I’m still laughing…….who invented spandex anyway? They should have made them in ONE size only!